An earring is an item of jewellery that has become vastly popular as a gift and even an everyday accessory. It’s attached to the ear, decorating it with various metal and stone cuts, shapes and sizes - adding flavour and flare to any outfit for various occasions. Earrings were once predominantly male ornaments, and they were popular in Asia over 7000 years ago. Now earrings are more common amongst women and we think it makes an excellent gift idea whether it’s for a birthday, anniversary, Valentine’s day and much more! In this blog you will learn about the different types of earrings that will help you choose the right earring gift for you or your loved ones. 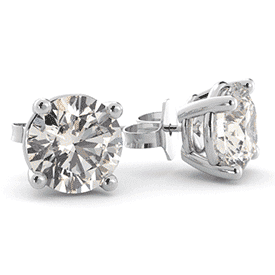 Diamond Stud Earrings: Stud earring are designed to showcase the stone’s brilliance and quality. The very nature of a stud earring does not have too much metal detailing or additional stones. The entire focus is just on one stone. As a result, diamond stud earrings make a simply elegant gift for all types of occasions like an anniversary, birthday, graduation, engagements and weddings. One of the advantages of the diamond stud earring is that it tends to be smaller and more inconspicuous - meaning that it is very suitable for everyday wear or even a special occasion. Chandelier Earrings: Chandelier earrings are a set of suspended stones mainly originating from India and the Middle East. It wasn’t until the 18 th Century that a French jeweller added diamond drops to make it what it is today. Chandelier earrings are long and is adorned with detailed designs that transforms an ordinary outfit into an elegant one. Chandelier earrings are eye catching and one of kind. At GoldeNet we have stylish range of chandelier earrings for you to choose from to be the perfect gift for those sporting a graceful aesthetic. As we mentioned before, while stud earrings aren’t bold, Chandelier earrings are made to dazzle and be a statement to your outfit. This makes it the perfect gift for those who love to dress boldly. 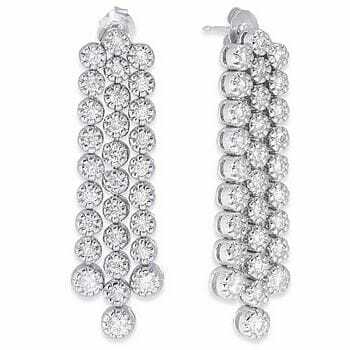 Diamond Drop Earrings: Drop earrings, as the name suggests, drops below the earlobes. Drop earrings are typically considered as simple pieces of jewellery, adorning stones like gemstones, diamonds, charms or beads directly at the base of the earring. 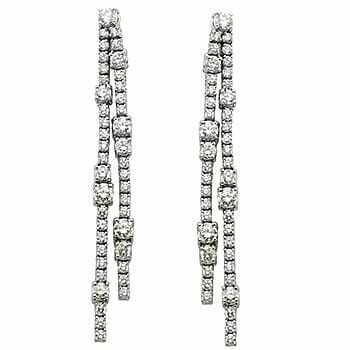 At GoldeNet we offer a brilliant range of exclusively diamond drop earrings styled for sophistication and drama. Much like the Chandelier earrings, diamond drops are also a bolder look. This means that if you’d rather the receiver wear your gift a lot - this might not be the best type of earring to get! However, if you know they love to create a statement with their fashion sense, this would make the perfect gift. Our earrings expertly designed to be the perfect gift for any woman or loved one. If you don’t like our handpicked designs, you can design an earring yourself through our website! Should you decide that you need further assistance with selecting earrings, why not speak with our qualified jewellers – the consultation is free and they aren’t paid a commission which means you get objective impartial advice! Contact us on 1300 361 873 or complete our online enquiry form.